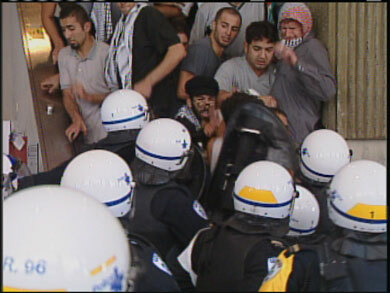 On September 9th, 2002, at Montreal's Concordia University, student union activists staged a violent protest to stop former Israeli Prime Minister Benjamin Netanyahu from addressing the Jewish student movement, Hillel, resulting in a riot and cancellation of the event. Hillel is a major international Jewish student organization with branches in almost every North American university. Throughout the months that followed, the student union demonstrated strong post-9/11 anti-American sentiment and, further, banned Hillel on campus, provoking angry outcries of anti-Semitism. 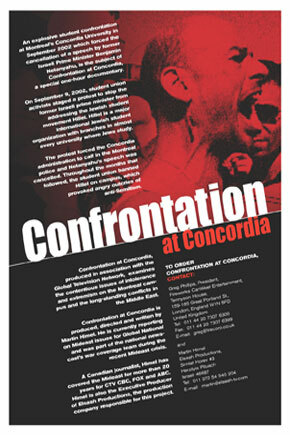 "Confrontation at Concordia" examines intolerance and violent activism in a microcosm of North American society - a university campus. Fueling this confrontation is the contentious issue of the long-standing conflict in the Middle East between Israelis and Palestinians.